Warrant Officer Class 1 (WO1) Hugh Blake was appointed Force Sergeant Major (FSM) of the Jamaica Defence Force (JDF) on the 27 December 2018. 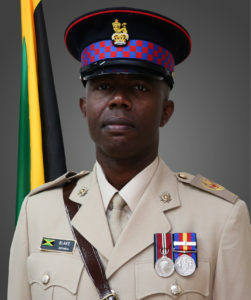 Prior to this appointment, WO1 Blake served for two (2) years as Force Chief Clerk with responsibility for general supervision of all clerks and the JDF clerical duties. Over the period May to September 1991, he attended and successfully completed a Clerk (General Duties (GD)) Course at the Force Educational Centre in Up Park Camp, Kingston. After completing that course, he was posted to Headquarters Jamaica Defence Force (HQ JDF) in November 1991. WO1 Blake holds a Level 2 NCTVET Certificate in Business Administration (Secretarial Skills), a Level 3 (Diploma) NCTVET Certificate in Administrative Assistant and a Level 4 NCTVET Certificate in Assessment. He attended and was successful in other professional courses such as Level 1 of the Government Accounting Course at MIND, where he also participated in Government Procurement Work Shop, and Supervisory Management at the UWI Open Campus, (Certificate of Achievement with Distinction), and a Peer Support Counseling Course at the University of Technology (Utech). His military decorations include the Medal of Honour for Long Service and Good Conduct (2008), the Queen Elizabeth II Diamond Jubilee Medal (2012) and the First Bar to the Medal of Honour for Long Service and Good Conduct (2014).